Ai Hoang was born in Vietnam and raised in Southern California. She graduated from the University of California, Berkeley in 2013 with a BA in Sociology. After working for two years as a Supplemental Education Services Tutor and a Development Associate for the Boys & Girls Clubs, Ai returned to graduate school to pursue a Masters of Public Health degree from the Columbia University Mailman School of Public Health. As a student in the Population & Health Department, she is specially interested in working to empower underserved families globally. 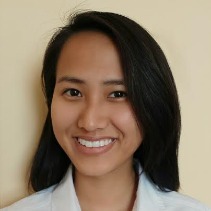 Upon returning from her fellowship, Ai reflects that "I'm very grateful for the opportunity that AEPD and the families affected by Agent Orange have afforded me this past year. They welcomed me into their home with open arms and shared amazing stories. They helped me understand the issue of Agent Orange on such a personal level and made this experience all the more memorable." With their team of five outreach workers who are all persons with disabilities (PWDs), AEPD is able to have a greater impact on the population that they serve. How? Well, the biggest part of it is trust. The community trusts these outreach workers and relies on them as a source of information. Outreach workers do many things. They link local PWDs to services, community resources and provide legal assistance to help them claim various benefits. In addition, outreach workers also identify ideal candidates for medical or economic support, and facilitate this process. One also cannot mention AEPD’s success in Quang Binh province without bringing up their unique model of peer support. What exactly is peer support? It is when people with similar experiences band together and provide emotional, social and/or practical support to one another. People with shared experiences will naturally be able to relate better to each other. The idea behind the model is simple, yet effective. Mr. Hoang Van Luu is one of the five outreach workers I was fortunate enough to meet at AEPD. His life story serves as an example demonstrating just how and why the model works so well. Born in 1964, Mr. Luu was barely three years old when both of his parents were killed by a B-52 bomber in an airstrike as part of the American War. They were two of the many villagers who lost their lives that day. Mr. Luu and his three older siblings survived the attack by hiding in an underground tunnel. When they emerged from the rubble, they found that their parents had passed. Mr. Luu’s grandparents became responsible for the care of him and his siblings from that day on. Times were tough for everyone in Vietnam because of the war. Unfortunately for Mr. Luu, things were about to get a lot tougher before they would improve. 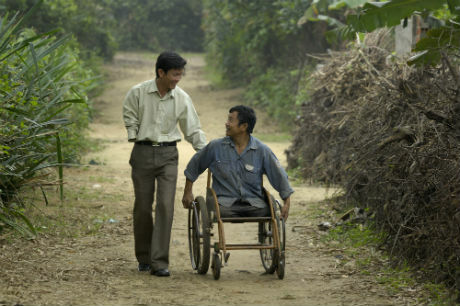 Four years after his parents had passed, Mr. Luu became a victim of an Unexploded Ordinance (UXO) accident. His brother had picked up a bomblet on the street and unknowingly passed it on to his sibling, thinking that the object was a toy. Mr. Luu was playing with the bomb when it detonated in his hands, completely blowing away his right hand and three fingers on his left hand. This horrific accident took place almost fifty years ago, in a time of war and conflict. 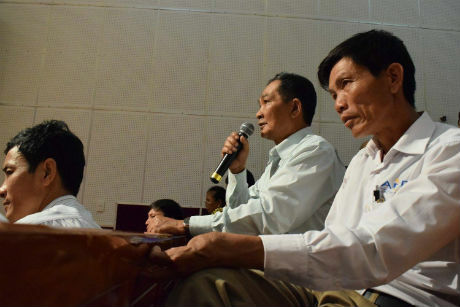 Unfortunately, forty one years later, landmines and UXOs continue to contaminate 100% of all communes in Quang Binh province today. Young children about Mr. Luu’s age back then are one of the groups most vulnerable to landmine and UXO accidents due to a number of reasons. Children are often naturally curious; many will pick up small bombs thinking they’re toys to be played with. Or, they might venture into unexplored parts of the forest to gather wood and walk their family’s buffalo, all activities that make it easier for them to stumble across a mine or UXO and causing such explosions. After the accident, Mr. Luu found it quite difficult to acclimate to life. He had to relearn how to do almost everything, from holding a bowl to picking up a pair of chopsticks. At school, children teased him endlessly and teachers doubted his abilities, but instead of wallowing in what he had lost, Mr. Luu strived to create a different life for himself. His hard work paid off when he tested into Hue University, one of the top schools in Vietnam, to study Biology. Unfortunately, tragedy would strike his life once again. Mr. Luu had fallen in love with a girl from his hometown. They wrote to each other but the distance between the pair was tough to overcome, and her family did not approve of the relationship. To be frank, they did not approve of Mr. Luu because of his disability. Eventually, the girl took her own life by jumping in front of a train. Devastated, Mr. Luu left university to return home. He could’ve let his disability defeated him right then, but instead he learned various trades such as animal husbandry and building stoves to support himself as he learned to live independently. He didn’t want to continue relying on his siblings. Mr. Luu learned as much as he could from his various trades and pursued a career in construction work. He was widely known around the province for his skills. Mr. Luu’s determination to make the best out of his situation made him an ideal candidate for the Landmine Survivor Network’s recruitment of outreach workers in 2003. He’s an original member of the team and has remained with the organization for thirteen years now. Today, Mr. Luu is happily married and living with his wife in Bo Trach District. Mr. Luu attending a workshop with fellow PWDs.